Celebrate the 100th Anniversary of the National Parks. Made in China. 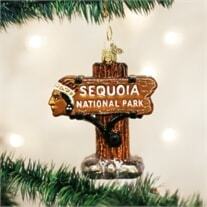 Gift Boxed.Sequoia National Park Ornament - Sequoia National Park in the Sierra Nevada Mountains was established in 1890. The park is home to the highest point in the lower 48 states, Mount Whitney. It is also famously known for giant sequoia trees, including the General Sherman tree. 4 1/2" Made in China. Gift Boxed.